With this condition a nail grows into the skin which can cause pain, redness or even infection. The ingrown nail can be clipped out or the root can be “killed” to prevent future recurrence. A common germ causes athlete’s foot, a fungal infection in the skin or between the toes. When this fungus gets under the toe nail, the nail will turn yellow, dark or thick. Oral or topical medication can cure the fungus. 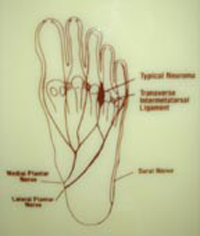 The plantar fascia, a ligament on the bottom of the foot, becomes inflamed when the arch falls. This causes arch pain or plantar fasciitis. Patients often try to fix this problem with a one-size-fits-all commercial arch support. Not a good practice with something as unique as the human foot. The most effective treatment is to have a podiatrist construct a mold of the feet and create a custom, rigid arch support (orthotic) that totally supports the planar fascia and relieves the pain for good. Warts are a skin eruption caused by a virus (verucae) that can be facilitated by some physiological stress. Most warts are harmless (though unsightly).The podiatrist can deal with the problem by cryotherapy (freezing), surgical excision, injection or topical or oral medication. There are 26 bones in the feet, more than any other part of the body, plus all the joints and tendons. That means a great deal of wear and tear. When the joint cartilage wears down, arthritis develops. If the tendons are overused, tendonitis develops. 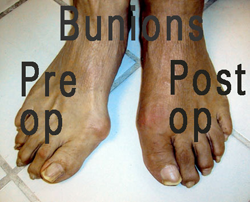 If these conditions aren’t treated, the result can be chronic pain or foot deformities. Orthotics, physical therapy, injections and special shoes can help alleviate these aches and pains. Diabetes affects 6% of the US population, roughly 15% of them will have some foot or leg problem at some time in their lives. Diabetes can have a devastating effect on the foot and leg, resulting in non-healing foot wounds and in severe cases, to leg or foot amputation. With regular visits to a podiatrist, most diabetic foot problems are preventable. See our Diabetics and the Feet page for tips on prevention. Our staff can work with your insurance company if you need custom shoes or insoles.